Anyone who knows me also knows I’m a little bit of a control freak, and a perfectionist. Making the decision to ask someone else to do the cover for Immagica was really, really hard. But I wanted the cover to be unique. The story was screaming for an illustrated cover, and I knew illustration was something I couldn’t do well. I made a compromise with myself (more than anyone) that I’d have a professional do the illustration, and then I would do the layout/design. See, I need to be in (some sort of) control. And it paid off—big time! 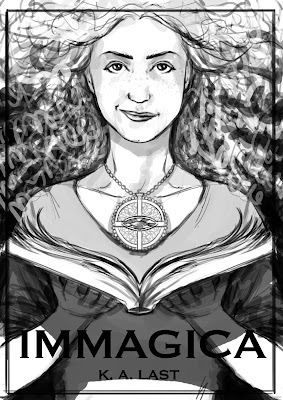 I am so very happy with how the cover for Immagica turned out, as you’d probably know if you follow me on twitter or like my Facebook page. Today I wanted to tell you a bit about the process involved with having someone illustrate for you. I’ve even got pics to show you! What I originally wanted is nothing like what I ended up getting. My vision was very different in the beginning. 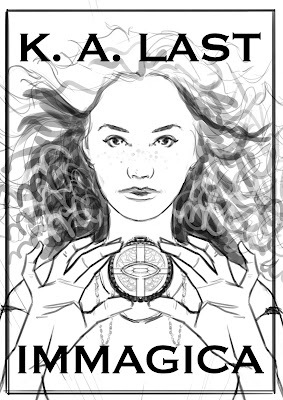 I wanted a leather-look cover with Rosaline’s amulet embedded on it like the actual book in the story. Think the cover of the book in The Neverending Story movie. My heart still yearns for this type of cover, so who knows, I might release a different edition later down the track (if all goes well). 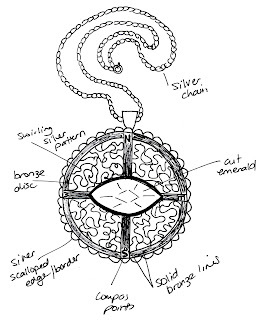 Below is a nice little sketch I did of the amulet that Rosaline wears. Now do you see why I needed an illustrator? For one, I can’t illustrate. I can draw if I put my mind to it, but it would take me forever to get it right and it would never be good enough. For two, how do you find a stock image of something your brain created? It turned out the sketch I did wasn’t a complete waste of time because the amulet still needed to be on the cover. 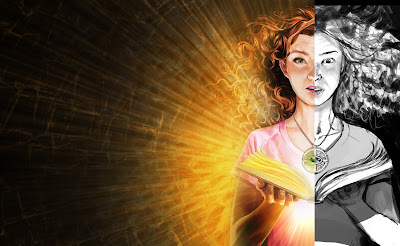 My illustrator, Lawrence Mann, steered me in a different (and better) direction. After all, he’s been illustrating for more than fifteen years, he probably knows what he’s doing. I’m just a mere layout designer with adequate (I like to think advanced) Photoshop kills. He said he had an idea, so I let him go with it. This is what he gave me on the first round. See how well my amulet sketch worked out for me! But, I admit I wasn’t sold. There are a few things I don’t like about this. 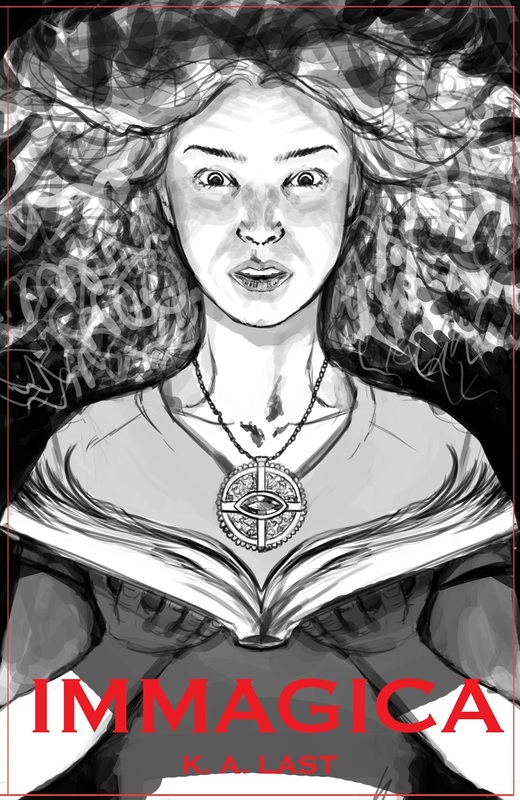 I couldn’t really gauge Rosaline’s expression, and the amulet is too big. Plus, it felt like she was saying, “hey, look at my amulet”. It’s just a bit awkward. I wanted the book on the cover as well since it and the amulet are such integral parts of the story. So, Lawrence sent me the full sketch. I liked this better, but I still didn’t like the way Rosaline was holding the amulet. By this stage, Lawrence was probably getting annoyed with me and my pickiness—it all stems back to being a control freak—but he was very patient and said he had another idea he wanted to show me. This is what I got. This sketch made me smile, big! We were almost there, but I wanted to fix a few things. 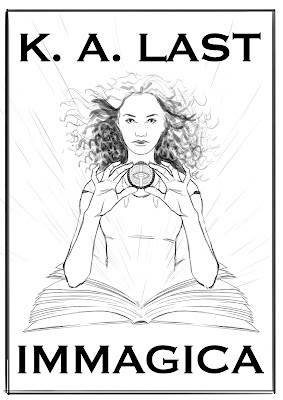 I loved that Rosaline is holding the book, but the amulet is too big. She needs short sleeves on her top, and her expression is a bit weird, as in it doesn’t fit the story. I wanted her awestruck and looking at the book, but Lawrence said we should maintain eye contact. I was all cool with that as long as she didn’t look like she was smirking in a bored kind of way. Lawrence went away again, tweaked a few things from my feedback, and he came back with this. Now we’re talking! This made me jump around the room like an excited idiot. I must admit I was a little concerned about her eyes. They’re creepy-looking in this sketch. And I questioned the proportion of the bars on the amulet. Here is where Lawrence probably rolled his eyes at me, and probably not for the first time. He assured me it’s just a sketch, and I needed to wait to see the final illustration. Everything would fall into place. Keeping in mind I like to be in control, I took a leap of faith and left it in his very capable hands. You've all seen the amazing job Lawrence did with the finished cover. The pic below gives you an idea on how accurate the final illustration is in relation to the sketch. The end result all comes down to communication and working with someone who is the right fit for you. Lawrence has an awesome amount of patience, which you need when you're working with a control freak like me, and I can guarantee I'll be asking him to do more work for me in the future. A great illustrator is worth every penny you pay them, plus a whole heap more. The process is not a quick one, but the end result is well worth the wait. To check out Lawrence's totally amazing portfolio, go HERE, and if you need an illustrator for your next project I can highly recommend him.